The trip began in Beijing. After a 13 hour flight via Air Canada, we stayed at a University campus close to where Tian's grandmother lives. I forget if I mentioned this before, but she was turning 88 years old and in China it's a really big year (Chinese people are very superstitious and 88 has two infinity signs). I haven't been back to China in over 10 years, so it was impressive to see how metropolitan it had become. After landing, I had my first experience of the driving in China. I thought Toronto driving was bad, but after the 30 minute taxi ride from the airport to where we were staying, I thought at least 4 times we were going to get into a car accident. More on this later. 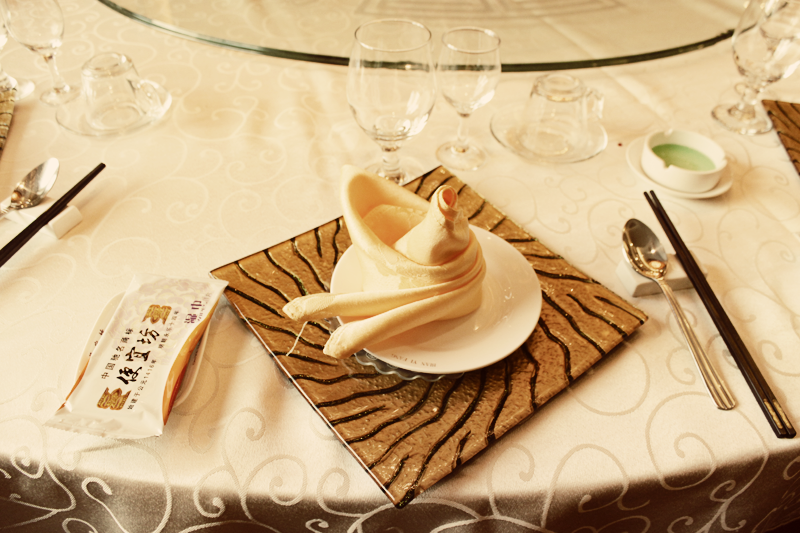 Here's a shot of the place setting from the restaurant we ate at in celebration of Tian's grandmother's birthday. The packet on the left is a wet nap, and I'm not particularly sure what that green substance is. It was either some sort of wasabi gel, or some sort of dip -- I just remember it wasn't sweet. If anyone knows what it is, please let me know! The food at this restaurant was delicious! 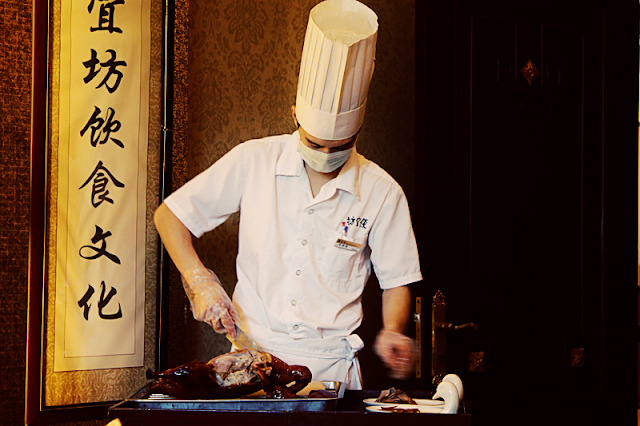 I particularly liked the table-side service for duck. I have some other photos of the food, but I'm sure you're all aware of the strange things that Chinese people eat and I thought it might be better if you didn't see certain things (for example frog leg stew). I have to admit that throughout this trip, I was not very adventurous with a lot of food. Another thing of note -- it was a bit frustrating eating in China because no one served cold water. If you ask for cold water at a restaurant, they will look at you with a "what is wrong with you" face. Everywhere only serves hot fluids since it is "soothing for the stomach." It was hard for me to eat the first few days since I drink truckloads of water when I eat a meal. To me, cold water is so refreshing. I ended up always carrying around a bottle of water for me before a meal. Sidenote: I also found this interesting. 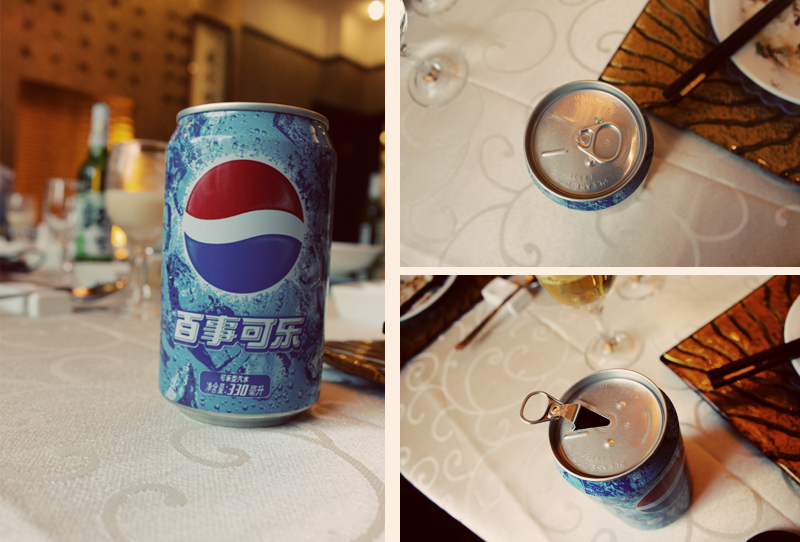 This is how you open a can of pepsi in China. Wow! What an amazing trip! I might be weird, but I think it'd actually be really interesting to see the frog leg stew! I love learning about different cultures. It is so cool that you got to completely submerge yourself! I am jealous!